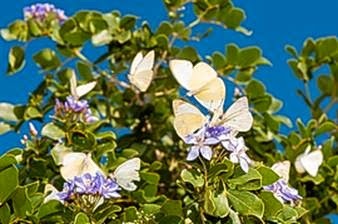 PHILIPSBURG--"It's like a lot of butterflies flew away from the Butterfly Farm," commented one resident on Facebook.com about the explosion of primarily Great Southern Whites (Ascia monuste) on the island in recent days. Huge swarms of this type of butterfly are not unknown to the island. It is just that they are early this year and in what appears to be greater numbers. "They are here year-round and breed year-round, but right now there are tonnes. The primary reason is probably that after a dry summer, we had lots of rain, which is the normal annual cycle," said naturalist and author Mark Yokoyama of Association Les Fruits de Mer. The butterflies are so plentiful they are seen dancing in swarms over roads and flying in waves over expanse of vegetation. With all the rain especially in October and November, the vegetation grew significantly, providing food for the Great Southern Whites' caterpillars. "Once the caterpillars grew up, then suddenly there are a tonne of adults." Many species such as the Gulf Fritillary are "very picky as caterpillars." Gulf Fritillary's caterpillars just eat plants from the passion fruit group. However, this is not the way of the great whites. Its caterpillars eat a pretty wide variety of plants. "This is probably one of the reasons why it can be so common." The clouds of butterflies are expected to continue for the foreseeable future.